PIPO X10 Pro 64GB TV Box Tablet comes with Intel Cherry Trail Z8350, Quad-Core up to 1.84GHz CPU processor and Intel HD Graphic(Gen8) GPU. 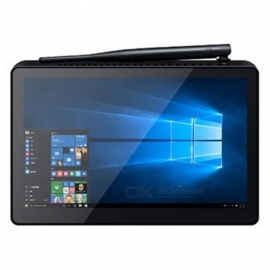 Adopts Windows10 + Android 5.1 System and 4GB RAM+64GB ROM! The 1920 x 1280 Resolution 10.8 Inch IPS Capacitive Screen brings you perfect visual enjoyment. Supports Bluetooth / HDMI function, performance is strong. Box Style design, gives you a unique experience! Built-in large capacity battery, providing long time in standby mode.